Theodor really didn’t like school much at all and if he had his druthers he would draw all the time. The Geisel family lived close to a zoo and he and his sister Marnie could actually hear the animals from their house in Springfield, Massachusetts. He was a curious kid with a “big imagination” and drawing zoo animals was one of his favorite pastimes. “Ted,” as Theodor was known, was a happy go lucky boy and about the only thing he “seemed serious about was drawing.” He tried to take an art class, but that was a total flop because he wasn’t much for “rules” and he “quit the class that first day.” Even when he headed off to Dartmouth he still was disinterested in school, but quickly found that drawing cartoons for the school newspaper was something that would interest him. Many people found him to be a “charming and friendly guy,” but he couldn’t make a living at that. Soon he was off to Oxford where he met Helen Palmer, a young woman who would encourage him to draw and dream. In this book, you will find out how Theodor “Ted” Geisel, a.k.a. 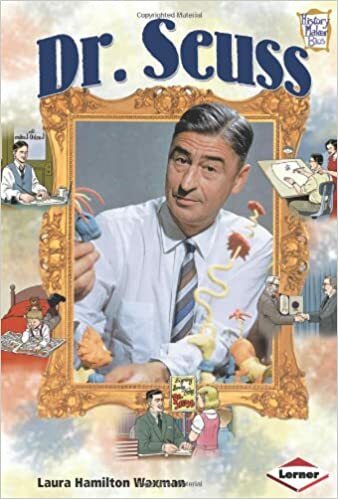 Dr. Seuss, finally earned enough money to get married, how his first book was rejected by the publishers, you’ll learn about the book he almost burned, you’ll meet his many creations like Horton and the Grinch, how and why he joined the military, how he came to write “The Cat in the Hat” and much more. Did you know that Ted also was against the unfair treatment of African Americans and “drew cartoons against racism?” There are many interesting things in this book that you’ll find fascinating! This biographical gem about Dr. Seuss will interest both young and old alike. Most people are aware of Theodor Geisel’s pseudonym, Dr. Seuss, but few know much about his actual life. This biography was very well written and drew my interest from the first few pages. Ted was a quiet man who helped many young children learn to read with his imaginative, zany stories and few will be surprised when they read things such as “200 million copies of his books had been sold” by the time of his death. I enjoyed the trip down memory lane and found that the numerous photographs, informative sidebars and art reproductions were a real plus. In the back of the book is an index, a select bibliography, a timeline, and additional recommended book and website resources.